Don't let the writedown of its Venezuela business and the changes to the tax code fool you. This was a good quarter. 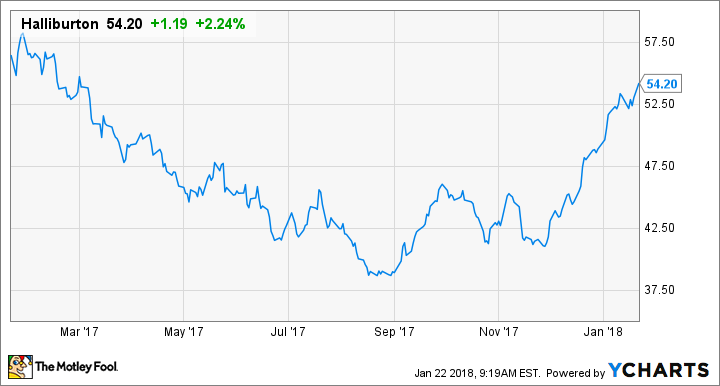 Halliburton (NYSE:HAL) did a great job in 2017 of putting the oil market slump and a botched acquisition behind it. It helps that the company has a massive presence in North America's shale drilling operations, which continues to outpace global oil and gas spending. After posting third-quarter results that exceeded every Wall Street expectation, though, the company's earnings fell back into the loss column in the fourth quarter because of special charges. Here's a rundown of these charges and why investors shouldn't be too concerned with them in the grand scheme of things. Also, let's look at what investors should be on the lookout for in 2018. Data source: Halliburton earnings release. EPS = earnings per share. After seeing a robust recovery in the earlier parts of 2017, this past quarter was adversely impacted by two significant writedowns. One of those was for its receivables in Venezuela. Like its oil services peer Schlumberger (NYSE:SLB), Halliburton is struggling to collect payments for equipment and services to Venezuela's national oil company PDVSA. As a result, management is writing down $385 million in notes receivable in the country as it doesn't expect to collect anytime soon. The other significant charge was related to recent changes in the U.S. tax code. A lack of drilling activity in past years and the charges Halliburton took in 2016 for the failed attempt to acquire Baker Hughes left the company with more than $2 billion in deferred tax assets at the end of the third quarter that it could have used against future earnings. However, the lower corporate tax also means less deferred tax assets. So the company took an $882 million impairment of those tax assets in the quarter. Absent those two charges, earnings per share would have been $0.52. The fourth quarter is typically the quarter with the highest revenue for Halliburton and most other major oil services companies. That's because they receive revenue for annual software updates and producers restocking their supplies of various types of drilling equipment and completion tools. This was the case this past quarter as management noted several end-of-year sales. These higher sales were most prevalent in the company's drilling and evaluation business segment. Data source: Halliburton earnings release. Chart by author. Perhaps the most encouraging sign in the company's earnings report was the uptick in free cash flow. So far this year, free cash flow has been hard to come by as the company reactivates idle equipment. It also made a one-time cash acquisition in the third quarter that ate into cash flow. This quarter, though, higher sales, a reduction in working capital, and a return to more normal capital spending levels led to robust free cash flow. 2017 was a transition year for Halliburton as oil prices rebounded and producers opened up their wallets again to drill in North America. As part of the company's press release, CEO Jeff Miller explained how this helped the bottom line and how it positions the company for the rest of the year. 2017 was a dynamic year for the oil and gas sector that marked another step on the road to recovery for our industry. I am pleased with the way our team executed on our value proposition, maintained strong service quality, and generated superior results and industry leading returns. Our Drilling and Evaluation division delivered an impressive performance over the second half of 2017, achieving nearly 50% incrementals in the fourth quarter. These results demonstrate the strength and diversity of our portfolio. Our Completion and Production division revenue grew 8% sequentially, outperforming the change in average United States land rig count. The North America completions market is tight, and demand for our completions equipment and our service quality remains strong. I am optimistic about what I see in 2018. Commodity prices are supportive of increasing activity in North America and I am encouraged by the increase in tender activity and the positive discussions we are having with our international customers. Charges for Venezuela and U.S. taxes aside, this was a good quarter for Halliburton. The company continues to deploy more idle assets, which means more revenue and higher margins. Halliburton and Schlumberger both anticipate margins for the oil services industry to normalize in 2018 as drilling outside North America starts to pick up after a multiyear lull. Considering the dominance of these two companies in the industry, it seems reasonable to expect it to happen. The company's debt levels are a little high right now. If the company's cash flow continues to improve as it did this past quarter, though, then it should be able to pay some of that debt down and give management some flexibility to do some more shareholder-friendly moves like buy back stock or raise its dividend. This trend is something investors in Halliburton should follow for the rest of the year.